Not only did we ride them there trails, we took pictures as well. 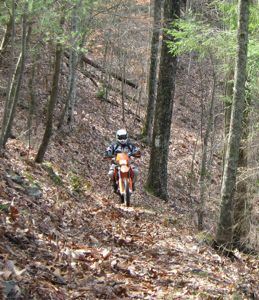 The Cherokee National Forest in Tennessee has two designated horse/hike/Motorcycle trails. Trail 81 and Trail 82. These are not recommended for beginners (or flatlanders anyway). Both are relatively short linear trails. Each has a few climbs and a bit of side-hill off-camber action. Believe it or not, we were there to ride the awesome backroads that wind along the mountains. These two single track trails were simply “hero section” options. Out of the several hundreds of miles of excellent, easy forest roads these two trails take up less than 12 miles together. Special thanks to Kieth L for recording & sharing the video.